Will Makeup Affect My Skin If It Is Prone To Acne? Are you tired of searching for products which will suit your acne prone skin? Well! Then we are here to help you with you the same. A little bit of advice for you, instead of buying products without looking at the ingredient list, and buy only those which have natural ingredients in them. 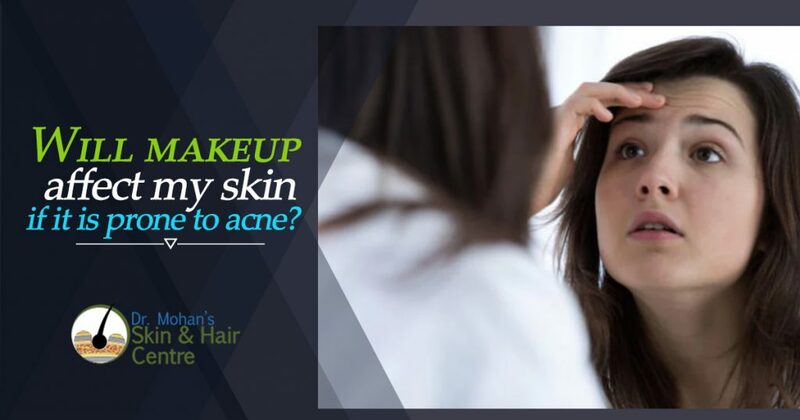 But, the question is that can make up make your acne worse? Let us read about the same here. Do I Have Acne Because I Use Too Much Makeup? Many salon people and makeup artists say that makeup helps in enhancing the best features and it does not hide things like acne. But, this is for those people who have clear skin, and not for those who are looking for treatments for acne. Many people think that makeup helps in increasing acne, blackheads, whiteheads, and pimples. While some others say that makeup helps in reducing the problem of acne. There are two different things being said on the same topic, so nothing can be clearly said. Can I Do Makeup If I Suffer From Acne? Yes. But do keep in mind the effect that makes up has on skin and also on your problem of acne. If the effects of makeup are not much and you love doing makeup, then choose the right make up products. The best thing which can be done is to choose products which are less likely to harm your skin. You can use products which are free from Phthalates( chemicals and plastics). You can use products having things like Sorbitan Olivate, Lavender Oil, ( basically which have natural ingredients in them). Also, buy products which do not worsen your acne. Products which have fragrance can damage the skin even more. If you are not sure about the effects the products have on the skin then you can consult your dermatologist. He will be able to guide you in a better way. How Do I Treat My Acne? The best way to hide your pimples is to look for acne treatment in India. If you notice a similarity between makeup and acne, you may have to avoid the make products and choose those products which are suited to your skin. The best treatment for acne is to clear your skin by using products like benzoyl peroxide which help in killing the bacteria inside the pores and also products which help in unclogging the follicle walls. Some acne treatments might dry your skin as they clear pimples and also prevent scars. Hence you should make it a habit of moisturizing your skin on a daily basis.